29 March 2017, 20.00-21:30 hrs. For much of history, strangers were commonly classified as barbarians and inferiors, seldom as fellow human beings. The notion of a common humanity still had to be invented. 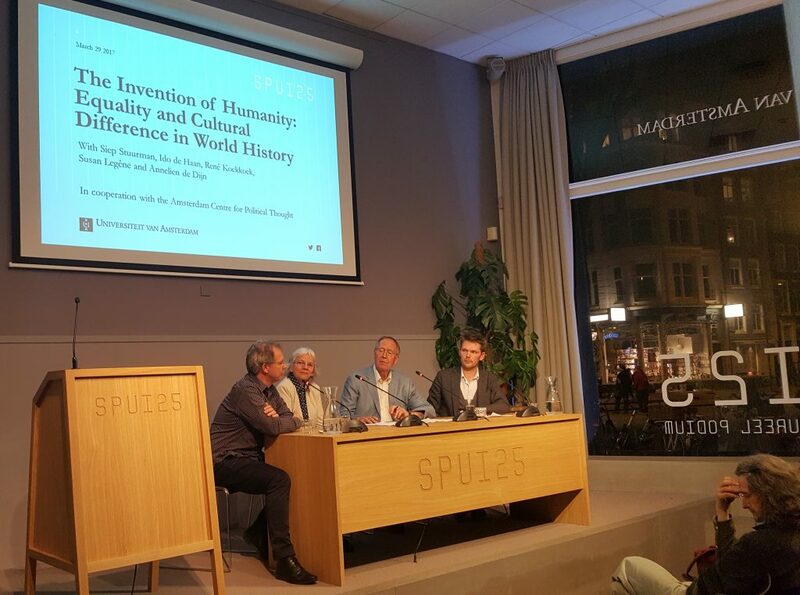 In his new book, The Invention of Humanity: Equality and Cultural Difference in World History, Siep Stuurman traces these evolving ideas of human equality and difference across continents and civilizations from ancient times to the present. Annelien de Dijn will interview the author, followed by responses from Ido de Haan, René Koekoek and Susan Legêne. Siep Stuurman is Professor of European History at Erasmus University in Rotterdam. For his Francois Poulain de la Barre and the Invention of Modern Equality (2004) he was awarded the George Mosse Prize by the American Historical Association. His earlier books include State Formation and Political Theory. Three Essays on Europe (1995) and The Tragic Fate of the Countess of Isenburg (1999). Ido de Haan is professor of history from the Middle Ages at the University of Utrecht. He specializes in the modern history of Western Europe. René Koekkoek is a lecturer in Modern European History in the European Studies at the University of Amsterdam. His research interests lie in the fields of history, political thought and philosophy from the early modern period to the twentieth century. Susan Legêne is Professor of political history and Head of the Department of Art and Culture, History, Antiquity, at the Faculty of Humanities at the Vrije Universiteit Amsterdam. Her research interest deals with the cultural impact of colonialism on postcolonial processes of state-formation, nation building and citizenship. Annelien de Dijn is director of the Amsterdam Centre for Political Thought. Her research focuses on the history of political thought in Europe and in the United States from 1700 to the present. She has a particular interest in the fraught and contested history of freedom and in Enlightenment political thought.